I wasn’t a huge fan of “Call of the Dead” which was included in one of the downloadable content packs for the original Black Ops. So understandably I was a little hesitant to see Treyarch returning to another standalone installment in the Nazi zombies series. Luckily, things are different this time. For one, we saw our three pals and Richtofen depart at the end of the Black Ops zombies series. So I’ve long gotten over their departure. But perhaps the most important point is that Treyarch appears to be returning to its roots. The story behind “Mob of the Dead” is actually pretty interesting. In the opening cutscene, you find out that these four mobsters were planning on breaking out of America’s most infamous prison, Alcatraz. Upon escaping their cells however, things are off. The guard that they killed to get out has stumbled out of the cell. One of the four troublemakers fires a shot but the guard doesn’t even flinch. They continue to unload a hailstorm of bullets into him until he finally drops. As they look at each other in bewilderment they realize that they’re no longer in the Alcatraz they know, they’re in the current day, with the prison in shambles. Probably the single, biggest change we’ve seen in a very long time is the addition of the Afterlife. Each survivor starts off as a translucent ghost with their arms outstretched in front of them. With this, you gain the ability to shoot lightning into the real world, zapping zombies, turning on power, and doing much more along the way. This mode also allows you to travel through gates that open in the map and let you travel through walls. There is a time limit on the amount of time you can spend like this before you die, but it does allow you to swap characters, something we’ve never heard of before. (When playing solo, you’ll automatically get three trips to the Afterlife) Each of these trips also serves as a revive, if you die and you still have a charge in the counter, you’ll be able to kill the zombies around you and revive yourself. Like I said before, it’s a wonderful invention that is a lot more friendly to new players. Everything about this zombies map is different, from the zombies who now sport glowing red eyes and barbed wire, to the weapon box which sports a new shape and look. Additionally, the Uzi and AK-47 make their zombies debut, while the Death Machine finds itself out of the power-ups and into the weapon box. 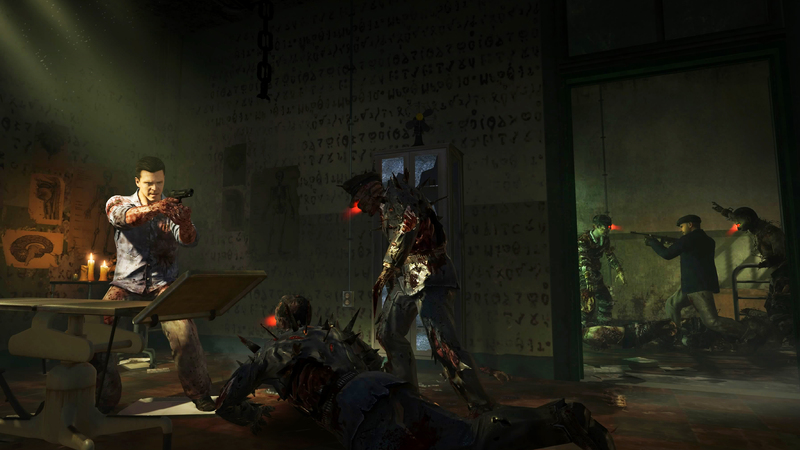 Mob of the Dead really is an amalgamation of all of the best zombie features to date. The traps from Ascension are back, a zipline like the one in Shi No Numa, and a new zombie boss named Brutus who acts similar to Romero from Call of the Dead. It’s a wonderful time to be a zombies fan as all of this is topped off by one of the creepiest environments we’ve seen in a very long time. Dead bodies hang from the walls, spiral staircases lead you deeper and deeper into the depths of Alcatraz, and at the bottom lies a room full of bodies hanging like carcasses in a meat locker. It’s been awhile since I’ve wanted to look around and explore the level rather than just play zombies, and that speaks wonders about this map. But we can’t forget that Uprising comes with four new multiplayer maps either. After all, Mob of the Dead is good, but not $14.99 (1200 Microsoft Points) good. It’s safe to say that Studio is the “hit” from this map pack; the first five games I played in the Uprising playlist all chose this map over anything else. A re-imagining of Black Ops‘ Firing Range, Studio takes place in a Hollywood movie set. The map layout remains completely unchanged, with only visual upgrades, so diehard fans already know what to expect. For the rest of you, just know that the map balances close to mid range moderately well with objective gametypes being the most exciting. For those of you looking for new multiplayer content though, that’s where the remakes end. Take Magma for example, as you fight in the enclosed streets of Japan as they’re overrun by an erupting volcano. Though it does have a slight issue with being able to get under the map, it’s a beauty to look at and the lava does throw a wrench in your plans. Meanwhile, Vertigo takes place in the futuristic high-rises of India. For the first time I can recall in recent history, Vertigo features a ladder that only works one way, meaning you can escape out of the center of the map through this route, but you can’t gain entry. Trust me, I tried and died, many times. On top of this, the center is isolated by sliding doors, which make objective gametypes really interesting. Around the outside of the map is a catwalk which hosts many small sheds, helicopter pads, and supplies to skirmish around. Finally, there’s Encore, which takes place around a London music festival. The close quarters map works extremely well with objective gametypes as the level is full of medium to small sized rooms. It’s slightly reminiscent of Grind, except reversed. Rather than an opened exterior and enclosed interior, it’s the other way around, with a slightly lowered center that features a stage and pit. I can’t help but recommend Uprising to those who are deeply invested in the Nazi zombies experience, the multiplayer maps, while well designed, are nothing special, but they will continue to buff the amount of content you get out of your online experience. It certainly would have helped had Activision and Treyarch sweetened the deal with some of the microtransactions they added since the last DLC such as new weapon skins, callsigns, or anything, but nope, just the same thing we’ve come to expect. And ultimately, that’s what keeps Uprising average, and nothing more. A copy of Uprising was provided on the Xbox 360 by the publisher for review purposes.